GLOBE: Global Collaboration Engine - What is a geometry? Home Documentation Overview What is a geometry? A geometry is a digital, georeferenced representation of the geographic entity described as the study site under investigation in a case-study. NOTE: It is common in the literature to represent many different types of geographic entities using a single point. This is appropriate for point samples (eg. soil samples) and smaller study sites (<< 100 km2 / 1 GLU), such as field plots and archaeological sites (but beware of geographic points without decimal places!). However, it is always best to map a more precise geometry corresponding to the extent of the study site, for which the data are provided in the case. Using ArcGIS, a member of the GLOBE team created and uploaded the georeferenced geometry seen below into the GLOBE system to represent the study site. McCracken, S.D., Brondizio, E.S., Nelson, D., Moran, E.F., Siqueira, A.D., and Rodriguez-Pedraza, C. (1999). 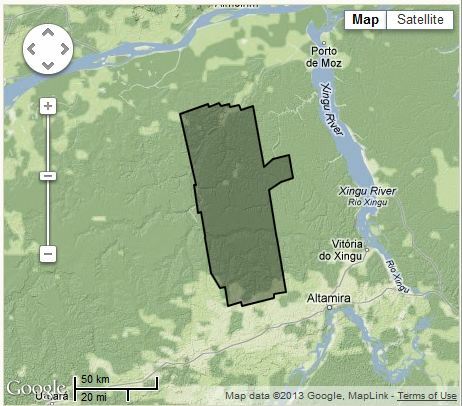 Remote sensing and GIS at farm property level: Demography and deforestation in the Brazilian Amazon. 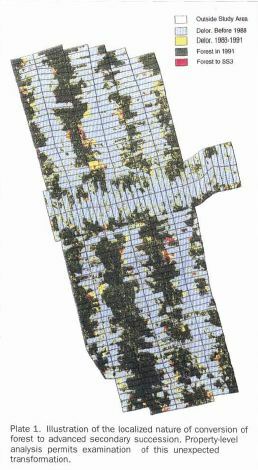 Photogrammetric Engineering & Remote Sensing, 65(11): 1311-1320.